The Breeze 2 glucose test strips use a convenient pre-loaded test strips disc containing 10 glucose test strips. The automatic test strip disc eliminates the need to handle small individual test strips, along with the auto calibrations this makes testing your blood glucose level easier than ever. The Breeze 2 test strips use advanced capillary action that pulls blood onto the test strip automatically. Get results in as little as 5 seconds. 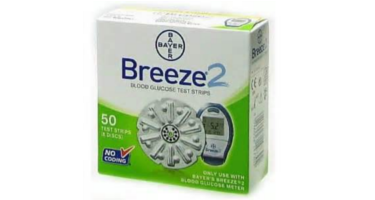 Breeze 2 Blood Glucose Test Strips are designed for use with the Breeze 2 Glucose Meter Kit.